The West Indies are an archipelago with more than one thousand islands that separate the Atlantic Ocean from the Caribbean Sea and cover a distance of 2,700 km from Barbados to the most western tip of Cuba (Howard, 1973). They are not in contact with the continents although they are relatively close, at about a distance of 150 km between Grenada and South America and 210 km between Cuba and Yucatan. These islands are generally divided into three archipelagos with different topography and independent geological history, i.e., the Lesser Antilles, Greater Antilles and the Bahamas Archipelago (Bahamas Islands + Turks and Caicos Islands). The Lesser Antilles belong to a small volcanic arc with about 21 main islands and numerous islets and keys dating from Mid Eocene (about 45 m.y.) with an approximate total area of 8,320 km². These islands are commonly referred to as the Windward and the Leeward Islands according to their position relative to the prevailing winds. The Windward Islands in the south are directly exposed to the south to north trade winds, while the Leeward, in the north, are sheltered from these currents. The Windward Islands include: Grenada, The Grenadines, St. Vincent, Barbados, St. Lucia, and Martinique, while the Leeward Islands include: Dominica, Marie Galante, Guadeloupe, La Desirade, Montserrat, Antigua, Nevis, St. Kitts, Barbuda, St. Eustatius, Saba, St. Barthélemy, St. Martin, and Anguilla. In contrast to popular opinion, the islands north of the South American coast do not belong to the Lesser Antilles, these include the Netherlands Antilles (Aruba, Curacao, & Bonaire), the Venezuelan Antilles (Las Aves, Los Roques, La Orchila, La Blanquilla, Tortuga, and Margarita,), and Trinidad and Tobago. The Greater Antilles, which lie northwest of the Lesser Antilles, comprise the islands of Cuba, Cayman Islands, Jamaica, Hispaniola (Dominican Republic + Haiti), Puerto Rico, and the Virgin Islands, plus hundreds of cays and islets for a total approximate area of 211,108 km². Their respective areas are as follows: Cuba: 114,524 km², Hispaniola: 76,290 km² (Dominican Republic: 48,380 km² + Haiti: 27,560 km²), Jamaica: 10,830 km², Puerto Rico 8,959 km², Virgin Islands: 505 km² (USVI: 352 km² + BVI: 153 km²), and Cayman Islands: 264 km². The Virgin Islands are sometimes classified as belonging to the Lesser Antilles, however, geologically (except for St. Croix) they form part of the Puerto Rican insular platform, and therefore they should be considered part of the Greater Antilles. The Greater Antilles posses an extremely complex geological history with its islands made of strata of different geological ages. Western and Central Cuba contain the fragmented remains of the North American tectonic plate (of Precambrian age, i.e., ca. 1000 m.y. ), Cretaceous volcanic rocks and associated oceanic crust, and Jurassic to Lower Cretaceous limestone (Draper et al. 1994). Eastern Cuba, Northern Hispaniola, Puerto Rico, and the Virgin Islands are derived from materials of the Caribbean plate consisting of a Jurassic oceanic basement (ca. 200 m.y.) overlain by Lower Cretaceous to Tertiary island arc deposits (115-60 m.y.). On the other hand, Jamaica and Southern Hispaniola, have a basement of Upper Jurassic to Lower Cretaceous oceanic crust (160-100 m.y. ), overlain by Upper Cretaceous volcanic rocks and tertiary sedimentary limestone (Draper et al., 1994). (Draper et al. 1994), and is comprised of hundreds of islands for a total approximate area of 10,070 km². The geography of the West Indies is highly variable with numerous habitats and microclimates capable of sustaining an extremely high diversity of plants. These islands are said to have been covered by forest of various kinds in almost their totality when the Europeans arrived more than 500 years ago (Labbad y Lasierra, 1788). Through time, the colonial powers transformed the prevalent natural habitats through logging, and the establishment of large scale plantations, range lands, and permanent dwellings. The European colonization brought about a considerable biotic exchange, bringing in numerous crops and weeds and taking back to the Old World an equal amount of economical and weedy species. The destruction of the natural habitats has been extensive, spreading over the whole region. The amount of forest that remains nowadays on these islands varies from 3.2% (in Haiti) to nearly 84% (in the Bahamas) of their total territory, for an average of 25% for the entire West Indies. Most islands however, have between of 21% to 30 % of their territory covered by trees (FAO map), these forming natural forest, secondary forest, or sometimes active or abandoned forest-like plantations. Because of the generalized destruction and degradation of habitats in the West Indies we do not know with certainty how many plant species may have been lost in the past. The base line for conservation studies in the region comes from the early botanical surveys carried out by French and British naturalists, nearly two hundred years after the discovery of the Americas. These include the work of Plumier (1693, 1703, 1755-60) in the French colonies, and the work of Plukenet (1691), and Sloane (1696, 1707-1725) in the British colonies. These early publications contained numerous illustrations and although based on polynomial (phrase) names (later to be replaced by the simpler binomial system of Linnaeus), they opened a window into the vast richness of Neotropical plants, depicting plants never seen by the Europeans. The work of Plumier, who mostly worked in Haiti, has been a particularly important source of generic and specific names for Linnaeus, Jacquin, Swartz, and posterior botanists. Likewise, the work of Sloane in Jamaica (and other British colonies) has been a corner stone for Caribbean botany. JAMAICA: 135 species. e.g., Cyperus elegans, Piper aduncum, Piper amalago, Rivina humilis, Sapindus saponaria, Tragia volubilis, Passiflora rubra, Theobroma cacao, Conocarpus erectus, Plumeria rubra, Plumeria alba, Cestrum nocturnum, Melothria pendula, Cucumis anguria. LESSER ANTILLES: 75 species. e.g., Phaseolus unguiculatus, Plukenetia volubilis, Gossypium barbadense, Solanum mammosum. HISPANIOLA: 20 species. e.g., Cupania americana, Paullinia pinnata, Hippocratea volubilis, Mammea americana. CUBA: 7 species. e.g., Phaseolus vexillatus, Cestrum diurnum. PUERTO RICO: 2 species. e.g., Guaiacum sanctum. Although the number of Caribbean species listed in Linnaeus’ Species Plantarum is very low, its contribution to Neotropical botany is substantial, due to the fact that most of these species are either wide-spread in the Neotropics or are economically important. In posterior publications (1756-1767), Linnaeus described several additional dozens of plants based on West Indian collections. The Dutch born Austrian botanist, N.J. Jacquin (1727-1817) is one of the most important early contributors to the Caribbean flora. As opposed to Linnaeus, who never visited the West Indies, Jacquin spent nearly 5 years (1755-1759) in the Caribbean region (West Indies and the north coast of South America) collecting plants and seeds for the first official Austrian botanical expedition (D’Arcy, 1970). Jacquin described numerous new species of West Indian origin in some of the lavishly illustrated botanical treatments prepared by him (1763; 1800-1809). At the turn of the 18th century, the work of the Swedish botanist, O. Swartz (1760-1818) is among the most important early work in the region. Swartz explored the islands of Jamaica, Cuba, and Hispaniola and published several books on various subjects or Caribbean botany. Among the most important one is his Florae India Occidentale (1797-1806) the first attempt of a synthetic flora for the whole Caribbean region, where 1,005 species of plants were accounted for (Urban, 1898). Although many workers contributed to expanding the knowledge of Caribbean botany during the first half of the 19th century, the most comprehensive of all, is the work of A.H.R. Grisebach (1814-1879). In 1857 Grisebach published a checklist for the plants of the Caribbean region where he listed 1,486 species (Urban, 1898). This publication was followed by his Flora of the British West Indian Islands, published from 1859-1864 where 3,409 species were treated, being the most comprehensive Caribbean floristic treatment at the time. At the turn of the 19th century, botanical studies in the Caribbean acquired a new dimension with the work of I. Urban (1848-1931). His Symbolae Antillanae, published from 1898 to 1928, is extremely important as numerous genera and species from the West Indies were therein described for the first time. In particular, this work constitutes the first attempt to describe the flora of Hispaniola, thanks to the exceptional contributions of the Swedish botanist, explorer and plant collector Erik Ekman. Urban and Ekman coauthored more than 600 taxa of seed plants, either described in Urban’s Symbolae Antillanae or in various scientific journals. Contemporary to the work of Urban, is that of N.L. Britton (1859-1934), founder of the New York Botanical Garden, who substantially contributed to the study of Caribbean botany. In his Botany of Porto Rico and the Virgin Islands (Britton & P. Wilson, 1923-26), he described numerous endemic species and refined many of the generic concepts applied to the region. The second half of the 20th century, received the contributions of Bro. León (1871-1955), H.A. Liogier [(also known as Bro. Alain) 1916- ], R.A. Howard (1917-2003) , C. D. Adams (1920-2005), and G.R. Proctor (1920-) among others. The most important floristic publications of these and other workers are summarized in the following table. Bahamas Britton & Millspaugh, 1920; Correll & Correll, 1982 (illustrated flora). Cuba A. Richard, 1845 & 1850; Grisebach, 1860, 1866; León, 1946; León y Alain, 1951-1957; Alain, 1962, 1969; Flora de la República de Cuba, 1992-present. Cayman Islands	 Hitchcock, 1893; Proctor, 1984. Jamaica Browne, 1756; Linnaeus, 1759; Macfadyen, 1837-50 (incomplete work); Fawcett & Rendle, 1910-36 (incomplete work); Adams et al., 1972; Proctor, 1985 (ferns); Proctor 1967, 1982. Hispaniola Liogier, 1982-2000, Dicotyledons (Cactaceae, monocotyledons, gymnosperms and ferns to be completed). Haiti: Barker & Dardeau, 1930. Dominican Republic: Moscoso, 1943; Jiménez, 1967. Puerto Rico Stahl, 1883-1888; Britton & P. Wilson, 1923-26 (the most complete floristic treatment for Puerto Rico and the Virgin Islands); Liogier, 1985-1997 (dicotyledons); Little & Wadsworth, 1964; Little, Wadsworth and Woodbury, 1974 (trees); Proctor, 1989 (ferns); Ackerman, 1995 (orchids); Acevedo-Rodríguez, 2003, 2005 (vines); Acevedo-Rodríguez & Strong, 2005 (gymnosperms & monocotyledons); Peterson et al. (in prep., grasses). Lesser Antilles Flora of the Lesser Antilles (Howard, 1974-1989); Flora of the Netherlands Antilles (Stoffers, 1962-1966); Flore illus­tree des phanerogames de Guadeloupe et de Martinique (Fournet, 1978); Flora phanerogamique des Antilles Françaises (Duss, 1897); Flora of Barbados ( Gooding, Loveless & Proctor, 1965), Flora of Dominica (Hodge, 1954, Nicolson, 1991); St. Bartholomew (Questel, 1941); The Grenadines (Howard, 1952); St. Vincent (Royal Botanic Gardens, Kew, 1893); and St. Eustachius, Saba & St. Martin (Boldingh, 1909). The above summary table shows the abundance of single islands floristic treatments. While the flora of most islands has been studied, a floristic assessment of the entire region is still lacking. In spite of the long tradition of botanical studies in the West Indies, much work remains to be done. There are abundant floras for individual islands or for groups of islands, but a comprehensive flora for the whole region or for the Greater Antilles is still missing. Plant endemism in the West Indies has never been calculated with certainty due to the lack of reliable floristic information for the whole region. Centuries after the treatments of Swartz (1797-1806) and of Grisebach (1857) we still do not have an absolute number of the taxa occurring in the West Indies, as there are numerous problems to be solved. These include taxonomical, nomenclatural, bibliographical, place of origin and distribution issues to evaluate. In the last few decades, there have been some attempts to further characterize the West Indian flora and its relationship to other areas of the globe. In 1973, Howard discussed the origins, relationship and distribution of the Antillean vegetation, presenting accounts for generic diversity and endemism values for the different islands. More recently, Myers et al. (2000), and Mittermeier et al. (2004), have identified the Caribbean region as one of the biodiversity hotspots with high priority for conservation. In fact, Myers et al. (2000), based on biodiversity richness (endemism) and loss of habitat, declared the Caribbean region the third most important global biodiversity hotspot. A recent paper by Santiago-Valentín & Olmstead (2004) presents an excellent review of the historical biogeography of Caribbean plants. They compared the West Indies floristic diversity to other archipelagos of the world and provided estimates of diversity and endemism for the Caribbean as a whole and for the individual islands. In spite of the recent progress in understanding the origins and composition of the West Indian flora, much work lies ahead. The referred works contain only approximations of the total flora and levels of diversity, as a comprehensive analysis of the flora has never been possible. In more recent years, at my lab at the Smithsonian Institution, we have been compiling and analyzing the various floristic and monographic accounts for the seed plants of the region. Although our work is not final, our numbers substantially differ from previous estimates of total diversity and endemism in the West Indies. In the next paragraph we are providing a summary of our work, which is posted in its totality on the Checklist section of this website and which will be printed in book form by summer of 2009 (Acevedo-Rodríguez & Strong, in prep). The West Indies contain a total of 231 families of seed plants. However, only 205 of these are indigenous to the region, all of which are shared with other areas of the Neotropics. Of these, there are 17 families (out of 35) that are endemic to the Neotropics (Gentry, 1982) showing the West Indian flora to belong to the Neotropical floristic province as defined by Good (1974) and Taktajan (1986). 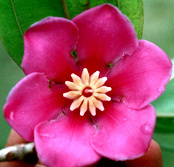 There are no endemic families of seed plants in the West Indies, although in the past, Picrodendraceae and Goetzeaceae were considered endemic. However, molecular phylogenetic studies have showed them to be nested within Euphorbiaceae and Solanaceae respectively, and therefore not meriting recognition at the family level. Family values are shown for individual islands in table 4, while the ten largest families of seed plants in terms of number of taxa and generic diversity are shown in table 2. Howard (1973), in a previous analysis on family diversity of the Antilles, did not show particular values, but his top families are for the most part consistent with the current analysis. There are a total of 1,945 genera of seed plants reported for the West Indies, 1,447 of which are considered indigenous, and 191 endemic (or essentially so), accounting for 13.2 % of generic endemism. The endemic genera are represented by 984 species, these contributing only close to 9 % of the total native seed plant diversity in the region. On the other hand, the most diverse genera in the West Indies are those with wide distributions, ranging throughout the Neotropics. A list of the ten most speciose indigenous genera is provided in table 3 in order to illustrate this point. For the most part, the taxa in these genera are endemic and correspond to the most diverse families in the West Indies. The current estimate for total number of seed plant taxa (species and infra species level) in the West Indies is 12,847, a number that includes exotics and commonly cultivated plants. The total number of indigenous taxa however, is ca. 10,948 of which 7,868 are endemic to the archipelago or part of it, contributing to nearly 72% endemism for the West Indies. Table 4 contains diversity estimates for different taxonomical levels of native seed plant flora on the different islands, groups of islands and for the whole West Indies. The present catalogue represents a compilation of botanical names of all seed plants documented to occur in the Bahamas Archipelago, the Greater and the Lesser Antilles as defined on our previous section. This checklist constitutes the first modern attempt to account for all the seed plants of the islands. The task is by no means completed since an accurate list requires in-depth knowledge of taxonomic groups in the area. Taxa recognition is based on expert opinion, and when that knowledge is not available we have followed in many instances Kew’s World Checklist, IPNI, and for the legumes ILDIS. The total taxa (species and infra species level) estimate for the area covered on our checklist is 13,033 including exotics and commonly cultivated plants. The total number of native taxa however, is ca. 11,050 of which 7,950 are endemic to the archipelago or part of it, contributing to nearly 72% of endemism for the archipelago. The following table (Table 4) contains estimates for different taxonomical levels found on the different islands or groups of islands. Endemism in the West Indies has never been calculated with certainty due to the lack of reliable floristic information for the whole region. Centuries after the treatments of Swartz (1797-1806) and of Grisebach (1857) we still do not have an absolute number of the taxa occurring in the West Indies, as there are numerous taxonomical problems to be solved. The current checklist however, is a reliable approximation of the taxa found in this region. The flora of the West Indies shares numerous floristic elements with the surrounding continents, especially with South and Central America. There are a total of 206 families of seed plants, none of which are currently considered endemic to the West Indies. There are approximately 1520 native genera, 181 of which are considered endemic to the West Indies, these mostly single island endemics, or shared among two islands (Francisco-Ortega et al, 2007; Acevedo-Rodríguez in press). 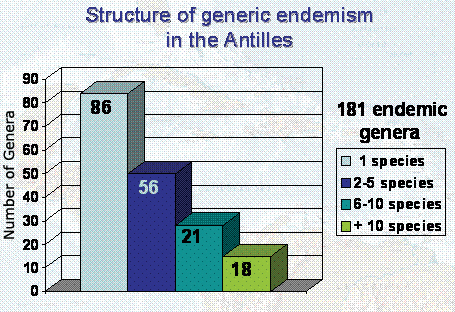 The generic endemism, therefore stand around 11%. At the species or infra specific levels there are ca. 11,050 taxa, of which 7950 are endemic to the West Indies, accounting for nearly 72% endemism (Table 3). Table 4. Values in parenthesis represent number of endemic taxa; G End= Generic endemism; T End= Taxa endemism. The diversity pattern exhibited by the endemic genera in the West Indies is shown in Figure 10. Nearly 48% of these genera are represented by a single species; 22% by 2-5 species; 11.5% by 6 to 10 species, and only about 10% of them with more than 10 species. Similar values have been presented in a recent paper by Francisco-Ortega et al. (2007), where only a small percentage of the endemic genera have numerous species. 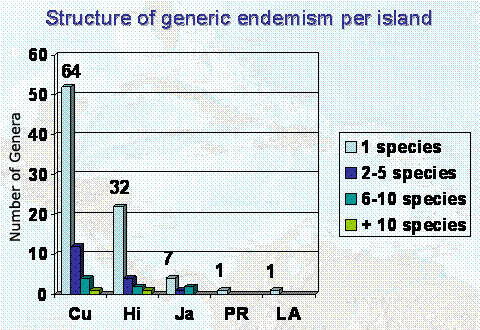 An analysis of the generic distribution by island shows that 105 of the 181 endemic genera are distributed on a single island (Fig. 11) and 80% of these are unispecific; a condition that makes the genera vulnerable to extinction due to habitat destruction. Data for the analysis of endemism structure at the species or sub-species level is not currently available for the Greater Antilles due to unresolved taxonomical and nomenclatural issues. However, a preliminary analysis of the Lesser Antilles endemic taxa shows that nearly one third of them (98 out of 305) are single island endemics. Endemic taxa present on two or three islands, account for another third, while the remaining third correspond to taxa that are distributed on 4 or more islands (Fig. 12). The vulnerability of the Lesser Antillean endemics becomes evident, as many of these taxa have restricted distributions. Habitat destruction due to human activity or natural catastrophic events could jeopardize the existence of these species.